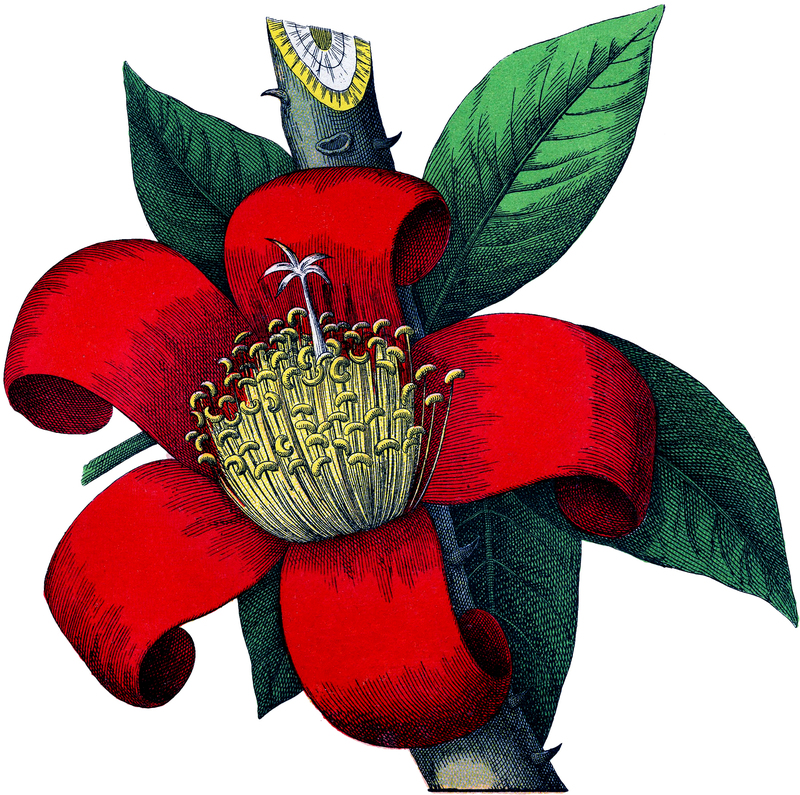 Today we have a beautiful collection of five Red Botanical Flower Images. These are free for you to use. The Antique Botanical Paintings are truly lovely and highly detailed Botanical Drawings. The Floral illustrations are beautifully and intricately drawn. The brilliant red colors are just simply amazing! The three tall flower drawings below would definitely make a great set to frame as a wall arrangement. Additionally, I think that these are perfect to use for Spring or Summer Garden themed Craft Projects or Handmade Cards! First we have a new addition to this site! 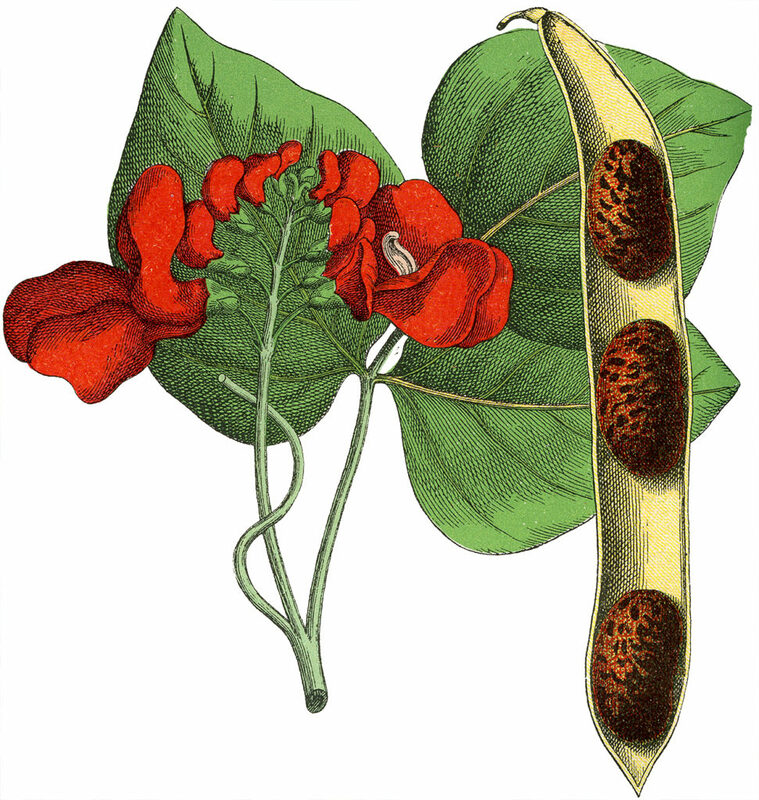 Here we have a cheerful looking red flower that looks like a sweet pea, but the pod looks like it has beans in it, so it may be some sort of bean plant. At any rate it’s a very pretty little blossom! I find the Red Botanical Flower Image pictured above of a Beautiful Red Flower with dark Green Leaves to be quite captivating! The vibrant colors honestly put me in the mood for Christmas, which makes me happy! Please be careful to ensure that you enlarge the image in order to see the detail clearly on this nice Botanical! This Botanical Illustration was scanned from an amazing Antique Botanical book from Germany that I truly cherish. The book is Circa 1890’s, and there are all kinds of wonderful Flowers and Plants in it. I share a few others below. Above is a Fiery Vintage Pinked Petal, Red Wildflower Image! This fiery red wildflower is called Fire Pink I believe. The ‘pink’ does not refer to the flower color but to the long petals, which look like they are ‘pinked’ or notched at the edges. It is a bright red flower with five petals on a slender stem with a pair of likewise thin spiky leaves just beneath the flower. It seems to project a certain mysterious aura for me. This is a Beautiful Botanical Lily Image! Shown here is a charming bright Red Orange Lily Flower! It has lovely spots on the petals. The yellow centers gradually turn orange and red at the tips. The stamens stand proudly in the center making it look formal. When my family lived much farther north near Pennsylvania, we had these interesting flowers like this growing all around our yard. It was so much fun to see them pop up every year without having to do a thing. They just magically seemed to spread naturally on their own! Incidentally, this one was also scanned from the Circa 1890’s German Plant Book also. Lastly, we have illustrated above a gorgeous Red Poppy Image!! Featured here is a very attractive picture of a Poppy Plant with a large, bright red bloom with ruffled edges. There is a beautiful bud just getting ready to open! 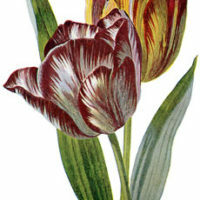 This one was also scanned from the Circa 1887 German Plant Book. I hope you enjoyed this sweet curated collection of 5 Red Botanical Flower Images! You might also like our Circa 1905 Garden Flower Illustrations HERE or 10+ Best Vintage Herb Images HERE! « Salt Dough Rose Tags + free printable! Karen, Thanks very much for another lovely flower. I don’t think I’ve ever seen one in our area, so I’ll need to do some research. Thanks Sue, good luck with your research! I’ve never seen one like this before – this is beautiful! However, this IS a Pink. Wild maiden pinks are a variety of wildflower that have since been cultivated as garden flowers, and are often known as dianthus or sweet William (their garden cousins have bigger petals and come in many more colors). The Duchess of Cambridge carried some in her wedding bouquet as a nod to Prince William.